This is one of the paintings that has been sitting starting at me for months and it is finally completed...I think! I think I jinxed myself with the title of this one as it has gone through many, many phases, many of which I regretted, then I managed to push & pull things back around until I was happy with it. 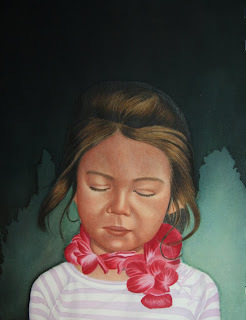 It has definitely been a learning experience and is much darker in color and mood than many of my portrait paintings.